Order your Cap and Gown! Are you interested in Career and Technical Opportunities within our district? DCSD offers a variety of training in everything from cosmetology to automotive to culinary! Click on the link to see all the amazing options students have! Are you interested in taking classes that count for both college and high school credit? DCSD has an incredible offering of classes. Click on the link to see some of the great courses available to you! Colorado 10th-graders who take the PSAT for the first time this year on April 19 or 20 can sign up for the Khan Academy's resources to help them study for next year's SAT. For more information about the Colorado PSAT 10, please go to collegeboard.org/colorado. To register for Khan Academy, students may go to this link: KhanAcademy.org. Click the ACT link above to see testing dates and locations, costs, etc. Click the SAT link above to see testing dates and locations, costs, etc. This is for ANY student who is a CURRENT SENIOR and has or is close to completing the 12 concurrent enrollment credits. As a high school college counselor, you are a critical resource to your students as they look to their future. We hope that you will look over our program information and discuss the benefits of attending a Stanford Pre-Collegiate Studies summer program with your top students as they make plans for Summer 2019. Please direct students to our website to learn more about our diverse program offerings. We offer programs across a wide variety of disciplines including arts, humanities, science, and math, giving highly motivated students the opportunity to investigate advanced topics not typically taught in secondary schools. Participants engage in small classes with brilliant instructors and peers who share their passions. Deadlines for our summer programs are in February, with some early round deadlines in January. Admission is selective. Limited financial aid is available. Stanford Summer Arts Institute students in grades 8–11 come together for a three-week intensive interdisciplinary arts program offering academically rigorous, hands-on courses in art, visual design, and music. Stanford Summer Humanities Institute students in grades 10 and 11 explore the big questions at the heart of the humanities in seminars led by distinguished Stanford professors during this three-week residential program. Stanford Pre-Collegiate Summer Institutes allows students in grades 8–11 to engage in single-subject intensive study selected from a wide range of disciplines, and benefit from small class size and academically themed residences. Stanford AI4ALL invites young women in grade 9 to apply to this three-week residential summer program. Participants learn about topics in AI, partake in ongoing research at Stanford, and receive mentorship from professors, graduate students, and industry professionals. Stanford University Mathematics Camp (SUMaC) students participate in a highly-selective program centered around lectures, guided research, and group problem-solving in advanced math topics. This four-week program is intended for an elite group of talented students in grades 10 and 11. Stanford Pre-Collegiate University-Level Online Math and Physics offers 13 courses throughout the year, including a summer term for high school students, grades 9–12. Students earn Stanford University Continuing Studies credit. 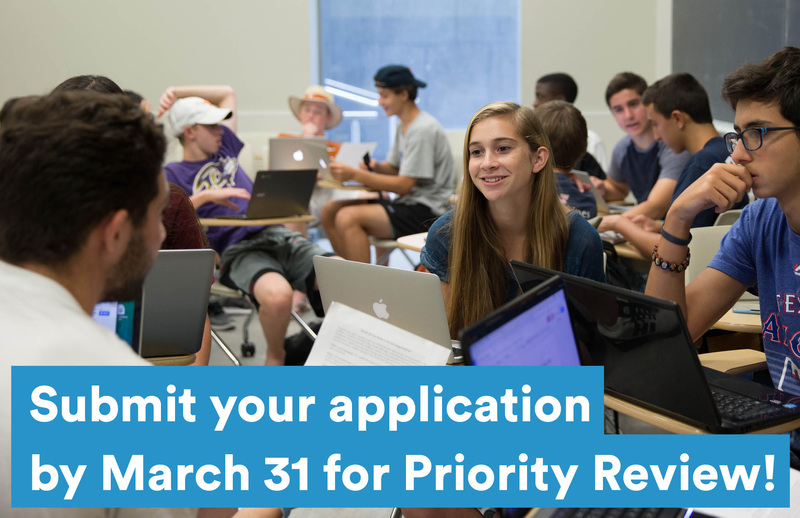 Although our Priority Registration Deadline ended yesterday, there's still time to enroll for a 2019 Summer Discovery pre-college enrichment, academic, or internship program. Our application will be open until programs fill up, and we operate on a rolling admission basis. In the meantime, join our webinar about the Summer Scholars Program at the University of Miami coming up on February 27. Click here to register, and if you can't make the webinar, register anyway, and we'll send you a recording after the webinar. Click here to take a look at our digital catalog. Scholarship and standard applications have just opened up for Camp Neuro Denver 2019! Students may learn more and apply by visiting http://www.campneuro.org. In addition, you may download a PDF flyer by clicking here. Copyright © 2019 Camp Cardiac & Camp Neuro, All rights reserved. Hello from the CU Denver | Anschutz Department of Bioengineering! We have exciting announcements for you. First, the Bioengineering Open House on the Anschutz Medical Campus is coming up soon! The event will be Friday, April 19th, from 4-6pm, and is a great opportunity to see the department and learn what the program is all about. See the attached flyer for more details and RSVP instructions, or click here. Second, we are excited to announce that our high school bioengineering summer camp BOLT is open for registration! BOLT, the Bioengineering Opportunities and Leadership Training camp, is a perfect opportunity for STEM students - campers get hands-on experience in a fun and action-packed 4 days exploring the field of Bioengineering on the Anschutz Medical Campus. See attached flyer for details/dates, or visit our website here. Improve your college application and go to college while still in high school! At Duke Summer Session, we are committed to providing high school students with the opportunity to be a college student over the summer at one of the world’s premier universities. By attending our Summer College program, you will not only have the authentic college experience of living in Duke University’s dorms and taking credit-bearing classes alongside undergraduate students, but also the opportunity to accompany your college application with a letter of recommendation from a Duke instructor and transcript from Duke University – two substantive indicators that you have what it takes to thrive in an elite academic setting. Or earn a certificate in one of our shorter programs: Summer Academy or our Accelerated STEM Academy!